This is the second public theme released under WPDesigner.com. I rushed on creating this one. 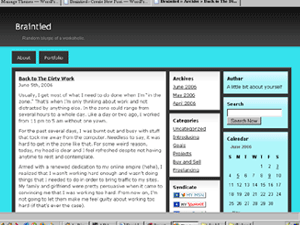 The original width of the content area is pretty small, ideal for personal blogs. Therefore, I’ve created an extended version (wider). The wide version could be put to good use for Adsense and/or photo blogs.